Lambton Kingsway Junior Middle School at Royal York Road and Dundas Street in Etobicoke, Ont. will be finished next November. The 17-classroom school is for junior kindergarten to Grade 8 students and includes an arts centre, library, special education and science rooms, a double gymnasium and lunchroom along with staff and administration facilities. Work on the $7-million school began in mid-October. 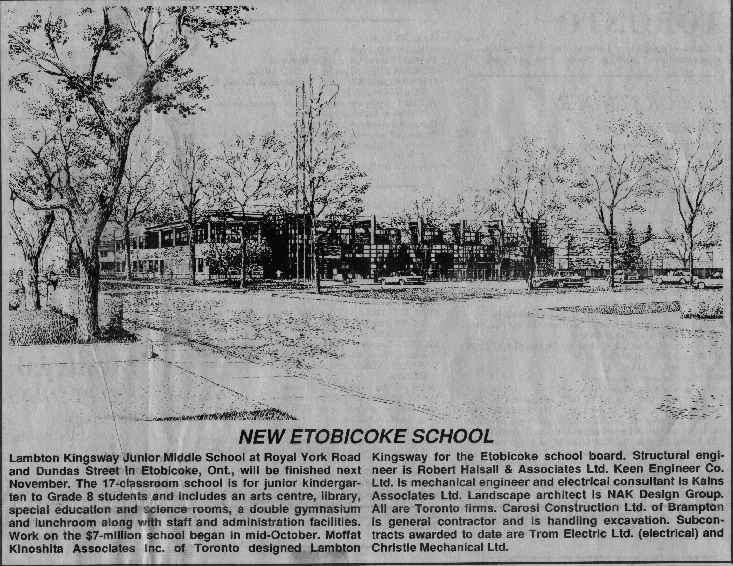 Moffat Kinoshita Associates Inc. of Toronto designed Lambton Kingsway for the Etobicoke school board. Structural engineer is Robert Halsall & Associates Ltd. Keen Engineer Co. Ltd. is mechanical engineer and electrical consultant is Kains Associates Ltd. Landscape architect is NAK Design Group. All are Toronto firms. Carosi Construction Ltd. of Brampton is general contractor and is handling excavation. Subcontracts awarded to date are Trom Electric Ltd. (electrical) and Christie Mechanical Ltd.